The following 15 young men from Trumbull, CT went onto the field at Howard J. Lamade Stadium in Williamsport, PA on August 26, 1989 and beat Kaohsiung, Taiwan 5-2 to become Little League Champions of the World. Trumbull didn't realize that they were not supposed to win!! (Jim Palmer - ABC Sportscaster & Hall of Fame Pitcher - said so). Dan Brown, Matt Basztura, Paul Coniglio, Chris Drury, Chris Fasano, Dave Galla, Jason Hairston, Todd Halky, Chris Kelly, Cody Lee, Harlen Marks, Ken Martin, Dan McGrath, Andy Paul, & Matt Sewell. Now that you know the final results, let me take you on the trip of a lifetime. Any kid who played Little League dreams of being a Champion. A few players could have been left behind. However, Jason Hairston decided to forget about soccer for the summer. Kenny Martin decided to return from Cape Cod early and Harlen Marks missed the entire California trip. This proved to be a good choice. So we hit the field on July 5, 1989 for our first practice and we did the same things that we always did at practice. When we were on the field we were all business. The coaching staff (Tom Galla, Bob Zullo & Ed Wheeler) decided to try to keep the kids loose off the field. We had fun with mandatory pool parties at Wheeler World, trips to the movies and watermelon and popsicles after practice. Jason told us he had already seen Batman and we told him he would see it again. Todd Halky & Cody Lee came with us but spent most of their time flirting with a couple of cuties from Monroe. These early days were very difficult for Bob, Ed & I because we were trying to get comfortable working with each other and also trying to place players in the proper slot. I began my speaking career around this time when we would hold a team meeting out in center field after each practice. I'm sure I bored everybody to tears. But I did tell the kids we were going to Williamsport, PA!! I wasn't alone, 7,000 other coaches were saying the same thing to their players. July 15th snuck up on us quickly and we were off and running. This began the "District 2" tournament in Bridgeport at Blackham Field. Andy Paul pitched the 1st game against Stratford National and pitched a "no hitter". This kid was good! We also hit the cover off the ball and won 23-0. Next we faced Stratford American and won 15-3. Then we beat Northend East 19-1 & Fairfield American 8-4. And then "Whoops" Park City American beat us 2-0. Luckily this local tournament was double elimination. The loss to Park City turned out to be a very important game for us. We had another center field talk the next night before practice and we asked the kids to do the talking for a change. "What happened and what were you thinking against Park City"? "Chris Drury struck out and we didn't think we could hit him" said Jason. (Chris was our lead off hitter and started 13 of 16 games with a hit). Wow! Were we going to depend entirely on that average sized hockey player who spits too much to do everything for us? No way! We're a team and each and every one of you must contribute. You have to pick each other up. So that is exactly what we did. Two nights later we faced Park City again and we won 7-0. On August 3, 1989 we had become District 2 Champions. This is a big deal for any Trumbull team. In all the years that Trumbull has played Little League baseball no team has advanced beyond one State game. So here we go. Let's play in the CT State Tournament. I'd never heard of Forestville, CT but within the next 10 days we will have beaten them twice after watching them play 4 times. Bob, Ed & I knew these kids almost as well as we knew our own. The Forestville people, in spite of the hard fought defeats they suffered, turned out to be our best friends and allies in what followed in the Eastern Regionals. On August 6, 1989 we defeated Forestville 4-0 in out first State game. Yea us!! On August 8, 1989 we beat Hamden 17-2. This ain't so tough! Then we faced our friendly enemies from Forestville again on August 13, 1989 and boy were we tough. Drury led off the game with a dinger and Brown gets another in the same inning. Kenny gets one in the 2nd and the score is Trumbull-8, Forestville 0 after 2 complete innings. Andy is devastating on the mound and everybody is real comfy going into the 5th with a 10-0 lead. Whoops again! Our buddies from Forestville woke up and before the dust settled they scored 6 runs. Andy moves to left and Danny McGrath moves to the mound. Chris gets up in the top of the 6th and hits his second homer of the game and our Australian lefty shuts them down and Trumbull tip toes away with the CT State Championship. Another valuable lesson is learned. Didn't Yogi say "It ain't over 'til it's over"? Coach Z has such a great memory too and he never stopped reminding me. Don't you hate it when somebody is always right? Now Trumbull was entering uncharted waters. What could we expect next? We were heading to Bristol, CT (Home of ESPN) to face New York, New Jersey, Delaware, Maine, New Hampshire, Vermont, Rhode Island, Massachusetts, Pennsylvania & Maryland. This would be a single elimination tournament and Trumbull would play 4 games. One on Tuesday, Wednesday, Thursday and Saturday and we had to win all 4 games. We arrived in Bristol, CT on Sunday August 13, 1989 and were greeted by John Heher who had assumed the point man role for our team. John was the District 2 Commissioner and also coached the Phillies in Trumbull. He had predicted all along that we were going to Williamsport. He must have been psychic! We were assigned a room in an elementary school next door to Breen Field. These were not luxury accommodations but we were happy to be there. 12 teams had arrived on Sunday and were each given a classroom with 16 cots obtained from West Point Academy. Believe it or not the cots were actually comfortable but the heat was oppressive. (No Air conditioning). The temperature each day was up in the mid 90's. The only relief from the heat was a large free standing fan in one corner of the room. It sounded like an airplane in the room with us. We were lucky because we got assigned the kindergarten room which had its own bathroom. We were also lucky because the Forestville people began taking really good care of us. There was Jerry Dube and his son Matt who brought Bob & I coffee every morning to get us started. There was also Bud Luflin who was President of Forestville LL and he told us to use their field for our practice sessions. This way we didn't have to worry about a practice schedule. We could practice whenever we wanted. Most important to us were the team Aunt and Uncle who were assigned to us. We got Rita Strahowski and her son Chris. These 2 willing volunteers were with us 12 hours a day helping us to feel at home. There were 12 teams in Bristol for this single elimination tournament and only one team would fulfill their dream of going to Williamsport and the Little League World Series. Let's hope that team is Trumbull! It's funny but at this point other teams gave up their local hometown identity and took on their state name. Whether Connecticut was too tough to say or we were just so attached to the word Trumbull I don't know but our team cheer before each game remained "Go Trumbull". John Heher had thought that we were going to draw a bye in the first round of the tournament. We were surprised to find out that this was not the case. This concerned us because we had been pitching Chris & Andy almost exclusively. Matt Sewell had been our #3 pitcher and starting right fielder until he fell off his bike while delivering newspapers and broke his arm during the state tournament. By not drawing a bye it meant that we would have to play 4 games in 5 days and win all of them. We were scheduled for Tuesday, Wednesday, Thursday and Saturday if we continued to win. Since Andy had pitched the final State game the previous Saturday the rotation would begin with Chris on the mound against Swanton, Vermont on Tuesday August 15. Bob, Ed & I decided that all we could do was play one game at a time. So let's go get 'em! We won that 1st game 17-3 on 15 hits and little Jason Hairston (A fun player to watch said Al Trautwig from ABC Sports) hit his 1st Little League home run that day. Wow!! Unfortunately, because Forestville had come back so strong against us in the States, we were afraid to replace Chris until the end of the 5th inning when we were up 17-1. What brave guys!! Chris had thrown 80 pitches which was way down from what he normally threw so maybe he'd be able to come back on Thursday. If we got to Thursday!! On Wednesday, August 16 we had to face Manchester, New Hampshire. They had drawn the 1st round bye so we had to face their #1 pitcher. When we saw him throw we knew this would be a different ballgame from the Vermont game. Luckily Chris Drury led the game off with a double and 2 pass balls later it was Trumbull-1- New Hampshire-0 and this ended up being the final score for the game. Andy threw a 1 hitter (On only 74 pitches) and their guy threw a 2 hitter. This turned out to be the toughest pitcher we faced throughout the entire summer! Everybody was losing weight this week, especially me. I think we were all too nervous to eat. In the beginning of the week the school where we lived was a madhouse with 12 teams running around. However, as each team lost they would pack their bags and leave for home. It became very quiet by mid tournament and by the end it was like a ghost town. Next up would be Cherry Hill, New Jersey on Thursday, August 17. My first recollection of Cherry Hill, NJ was the night before the Thursday game. We had been taken to Lake Compounce Amusement Park for some fun. We saw 5 big kids with baseball hats on and thought this could not be players from Cherry Hill. They were! Two of them were over 6 feet tall and the other 3 were as big as Kenny Martin. (5'10"). Just because they were big did not necessarily mean they were good, Right? True, except the day before they had blasted Massapequa, New York who everybody "in the know" said was headed for Williamsport. The other problem was that Chris Drury had thrown 80 pitches 2 days ago. So we took the attitude "No big deal", "It's just another ballgame", "Go get'em". These were to become favorite sayings for us. TRUMBULL NATIONAL proceeded to bang out 19 hits with 6 home runs in the most awesome display of power ever seen in Little League baseball. So said the Little League experts. Matt Basztura led off the 4th inning with a solo home run, then Kenny Martin hit #2, Andy Paul hit #3 and "Downtown" Danny Brown hit #4. Back to back to back to back home runs. Kenny came up again before the inning was over and he hit a Grand Slam for his 2nd homer of the inning. A local announcer nicknamed us the "Electric Company" after that inning because of all the power we generated. We had scored 9 times in the 4th inning and 18 times before the game ended and Cherry Hill was packing to go home. If this game had been shown on television people would have never stopped talking about Trumbull. Now there was only 1 team left between us and Williamsport and they looked a lot like another good team we faced along the way. They reminded me of our friends from Forestville. Brandywine didn't look big and awesome like New Jersey had and they hadn't destroyed anybody by a big score but they had won all their games. All they had to do was beat Trumbull once, so we would not take this game lightly. "No big deal"! Wrong! The final game against Brandywine was televised on ESPN and I was worried the kids would be distracted. I guess they weren't, as we continued our offensive assault. We gave them 2 runs in the top of the first and then all HECK broke loose again. In the bottom of the 1st we got 9 hits and 10 runs before the rain came. Poor Kenny Martin made the last out of that incredible 1st inning. He looked so sick up at bat. He also kept looking my way hoping the signal would be given for hit #10 of the inning. No, we needed that 3rd out in case the game was called due to rain at this point. With a complete 1st inning, if the game was stopped and resumed later we would start where we left off, with us up 10-2. Without completing the 1st inning, if the game was stopped and resumed later the game would start over at 0-0. Sorry Kenny, that K was mine and Mr. Zullos. Good Job! It didn't rain and the next time up we gave Kenny the Home Run signal and he complied. There is justice! We ended the game with 18 hits and a 2nd awesome offensive performance in a row. The final score was Trumbull-15 and Brandywine-5. 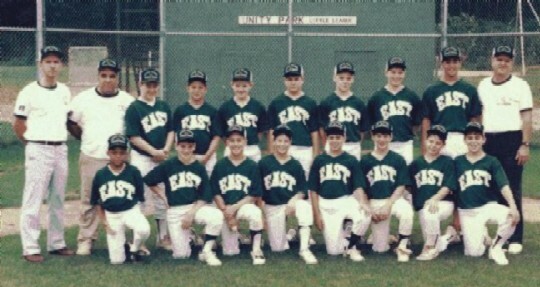 Trumbull was now crowned the 1989 Eastern Regional Champions and would be leaving for Williamsport, Pennsylvania the next morning to participate in the Little League World Series! Trumbull had an incredible week in Bristol when we outscored our opponents 51-14 and out hit them 55-21. I hoped nobody in Williamsport was watching. Wrong again, they all saw us. I guess Taiwan was not impressed! Trumbull National left Bristol after the "Breakfast of Champions" celebration on Sunday morning, August 20th. We had a 5 hour bus ride from Bristol, CT to Williamsport, PA and I think everybody needed the rest. We were exhausted! The coaches and kids napped and happily Matt Sewell joined us for the trip. This was a heartbreaking time because Little League headquarters would not allow Matt to be with the team because after he broke his arm we had replaced him with an alternate (Chris Fasano). In our opinion both of them deserved to be part of this team. Bob & Ed snuck Matt onto the team bus and he made the trip to Williamsport with the team. Ed was not able to be with us as only 2 coaches were allowed per team by Little League rules. The trip was scenic as Pennsylvania is such a beautiful state. The closer we got to Williamsport the more beautiful it became. By the way, Wheelz had made the kids a promise. He had been foolish enough to promise that is we went to Williamsport he would let them shave his head on home plate after the final victory in Bristol. Well they did win and then they did shave his head. Boy, that looked great! That looked like a nice thing to do! Andy Konyar from Little League headquarters accompanied us on the bus and Bob & I questioned him on what to expect once we arrived. Andy had already helped us in Bristol when he reminded the coaches that unless the 1st inning with Brandywine was completed we'd have to start over again at 0-0. WOW!! What a beautiful sight Howard J. Lamade Stadium was to behold looking down on it from on top the hill in center field. Our eyes began to get very large. After some formalities were taken care of we were sent for a physical exam and WOW for the 2nd time. The team from Kaohsiung, Taiwan was in front of us in line. They were wearing matching practice uniforms with identical everything including shoes, pants, shirts, hats, bags and even haircuts. We, on the other hand looked like a bunch of normal American kids with our casual clothes. We could have been in big trouble thinking that maybe we did not belong. So we decided to have a practice and shake off the cobwebs and try to become comfortable in our surroundings. Up until this time Little League was preparing all teams to lose. They told us how proud we should be of our accomplishments, (we were), and what long odds we had overcome to get where we were (we knew that). We also knew that we were not satisfied and were not ready to lose and be sent home. Whatever happened at that 1st practice I feel the kids came away from it with a very relaxed winning attitude. I think we all felt that Trumbull belonged in the Little League World Series and we were prepared to give it our best shot. So we forgot about Taiwan as they were a team we might meet on Saturday but that was light years from now. We had to prepare for Davenport, Iowa who was the Central Division Champion and as we were told, the 2nd worst team in Williamsport. We were told that the East was always the worst team to arrive each year. I guess Trumbull was lucky to have drawn Iowa and I guess we were also lucky to squeak by them by a score of 4-3. It was not a pretty sight as we only got 4 hits and only Andy Paul's homerun in the 5th did us any good. What helped immensely were 12 walks that we received and the fact that Chris Drury only issued 3 walks to them. They also got 4 hits. By the way, there were 2 gentlemen that we met upon arrival in Williamsport who took pretty good care of Trumbull. Uncle Ed Claudius and Uncle Ed Girio were assigned to our team just like Aunt Rita and Uncle Chris had been in Bristol. These 2 men helped show us the ropes and prepare us for what was to come. Although, I think we surprised them a little bit too. Well, Andy Paul was still 12 and I was still 40 for 1 more day, (we share a birthday on August 25th) but I was thinking it would be nice to have a birthday present a day early. Andy must have felt the same way because he pitched a fabulous game to put Trumbull into the World Championship game 2 days later. After giving up 3 home runs to the first 6 batters he shut San Pedro down completely except for a check swing single in the 6th inning. Andy became a complete pitcher this day as he found out early that the fast ball alone would not carry him against San Pedro's powerful hitters. He was able to change mid stream, and shut down San Pedro's bats for the rest of the game. Without Andy's tremendous performance that day Trumbull would not have advanced to meet Taiwan in the final game. He was superb!! I've got to admit that after those 3 home runs I was thinking about what we had done against Cherry Hill and hoping that San Pedro was not going to return the favor to us. They did not!! I felt really bad for Steve Williams, their pitcher. He looked like he didn't want to be on the mound that day and I guess he knew it from the start. In our half of the 1stinning losing 0-2, we scored 5 runs on 4 walks, 1 hit batter, 2 errors and 1 lone hit by Dave Galla. Once again it was not a pretty sight but it got the job done and as I said Andy was flawless the rest of the way. Trumbull was crowned USA Champions!! Many felt that we had reached the end of our road. No way could we win 1 more game. Why not? Taiwan went on the field next and destroyed the Latin American Champions from Maracaibo, Venezuela 13-0. But, their win wasn't pretty either. They only got 6 hits and Venezuela gave up 6 errors, so what was there to worry about? I almost made a terrible mistake after the USA Championship game. We had not let the kids go swimming all week in the beautiful outdoor pool located in our complex but I thought maybe it would be okay for them to go in today since we really didn't want them to watch Taiwan play Venezuela anyway. Luckily Bob caught up to us and killed that idea before it developed. He repeated to them that "swimming was for losers." He was right! All we needed was for one of them to get injured in the pool with the big game only 2 days away. Taiwan had not used the pool and neither had Trumbull. All the other teams had gone swimming. So they watched the game instead (Usually not a good idea), but it did not seem to bother them. By now they were a confident, not cocky, bunch of kids. The media attention was incredible for the next 2 days. Everybody wanted to talk to us even though they all thought they were talking to the loser. It's a good thing Taiwan could not speak English; otherwise nobody would have wanted to interview us. Luckily we were too busy to worry about our underdog role. We just knew there was one more game and only one team could win it and why not make the winner be us. "No Big Deal!!!" "We can do it" "Don't be cocky" "You guys aren't so good" "Relax" "Keep each other up" "Watch the ball into your glove" "Roll those wrists" "Don't throw it down the middle" "You guys are the best" They were brainwashed. Here goes nothing! So we had made it further than anyone believed we could (except us). We had traveled those light years between Sunday, August 20 and Saturday, August 26 and we were still playing ball. There were only us and the Goliath from the Far East. Taiwan had won the World Series in 1984, 1985, 1986, 1987 & 1988. Last year they beat Pearl City, Hawaii by a score of 20-1 and the year before they defeated California 10-2. Their victories had been so lopsided that ABC Sports actually left the game early, while it was still being played, to air something else. Let's not get embarrassed. Chris Drury took the mound against some kid named Lee. I still haven't found out if he was related to Cody. Henry says he doesn't think so! In remembering back to the game it seemed like there were 10 or 20 line drives to left field. Actually there were only 5 and Danny McGrath handled them very well. There were also 7 ground balls that we handled perfectly. Two of these grounders were attempted bunts that were supposed to be their specialty. Not today!! They also were supposed to be devastating on the bases. Also not today!! They tried to score from 2nd on a hit to the wall in left field. Danny McGrath turned and picked it up after it bounced off the wall and threw a strike to the plate from 200 feet. Cody caught it and tagged the runner out and they never ran again. Taiwan was beatable! We did to them what they usually did to their opponent. We had 6 hits in the final game and they all came at the right times and without the help of a lot of walks. They only gave us 1 walk. But what they did do was commit 2 errors to our 1. We were better than Taiwan defensively. We out hit them 6-5 and I guess the strategic moves we made were better then the ones they made. Chris Drury had a "LITTLE" to do with our victory. It wasn't the prettiest game he ever pitched but it was the most important, gutsiest performance that many people could remember seeing. He scattered 5 hits, struck out 2 batters, and walked 4 but 2 were intentional walks which could be charged against Coaches Galla & Zullo. He only gave up 2 runs, one in the 1st and one in the 5th when the coaches put a lot of extra pressure on him with the 2 intentional walks. Like I said, the bats came to life today and it was about time. Chris & Kenny each had 2 hits and 2 RBI. Kenny hit the big Home Run in the bottom of the 5th. Dave Galla & Cody Lee chipped in with 1 hit each and each scored a run. The final score was Trumbull-5 and Kaohsiung, Taiwan-2. Honestly, it felt like a lot of other games that we had played. Only it was the biggest game of our lives and we came away the winner. Trumbull National Little League from Trumbull, Connecticut had become the 1989 Little League World Champions! We had played 16 ballgames and won 15. We had amassed a .404 team batting average with 33 home runs. Chris Drury and Andy Paul had 15 victories between them and 1 loss, which Andy suffered against Park City way back on July 31. The team had played beautiful defense throughout the entire tournament. We never appreciated it so much as we did in the World Series when our bats cooled off and the runs didn't come so easily. It amazed me that these young men played with such skill and calmness in front of 40,000 people during our final game with Taiwan. Everybody contributed to make this team successful. I'd like to once again congratulate Dan Brown, Matt Basztura, Paul Coniglio, Chris Drury, Chris Fasano, Dave Galla, Jason Hairston, Todd Halky, Chris Kelly, Cody Lee, Harlen Marks, Ken Martin, Dan McGrath, Andy Paul, & Matt Sewell. Now the games are over and we accomplished something that no one thought could be done. We did it with talent, hard work and good old fashioned luck. Many great things happened after we came home. We were on Good Morning America, had lunch with Mickey Mantle in his restaurant, went to Yankee Stadium, Shea Stadium and Fenway Park, met President George Bush in the Rose Garden, went to the Major league World Series in Oakland and left the day before the earthquake of 1989 struck, went to Radio City Music Hall, went to visit Governor O'Neill in Hartford and many other events. Our lives had changed but soon returned to normal. We had all shared, in my opinion, the most wonderful summer of our lives. The summer of '89!! I'd like to thank some people who helped support us before, during and after our win. John DelVecchio, Pres. Of Trumbull L.L., John Heher, District 2 Commissioner, Aunt Rita Strahowski and Uncle Chris Strahawski, (Aunt & Uncle in Bristol, Eastern Regionals), Jerry and Matt Dube and Bud Luflin from Forestville LL, Uncle Ed Claudius and Uncle Ed Girio (Uncles at the World Series), Andy Konyar from Williamsport, State Senator Lee Scarpetti, Donald Trump (Trump Shuttle), Mickey Mantle (Mickey Mantle's Restaurant), Mickey Herbert (Physicians Health Services), Kay Williams (Captain Cove), John Vazzano (Vazzy's Restaurant), The Bridgeport Bluefish, Trumbull LL Board of Directors (Bill Woods, Tony Autuori, Wayne Stokes, Doug Waterbury, Ray Baldwin, George Hairston, Matt Kentosh, Joe Desabia, Betty Halky, Nancy Sparks, John Heher & Carl Charles), Marilyn Goldstone, Morag Vance (Trumbull First Selectman), Governor William O'Neill (Govorner- State of CT), Jamie Rose (The Grille & Bar), David and Marshall of Hochberg Jewelers, Connecticut National Bank, Ed Portalatin (Executive Printing and Graphics), Bob Fiondella (From the Eastern Regional center), Wayne Gretsky, WFAN, ABC, ESPN, David Hartman & Spencer Christian (Good Morning America), Mario Garrido (Home Plate Umpire vs. Taiwan-great strike zone & great call at the plate) Frank D'Angelo (Home plate umpire vs. Brandywine), Major League Baseball, the Yankees, the Red Sox, the Mets, Bart Giammati (Commissioner of Major League baseball), Mel Allen, Don Mattingly, Steve Sax, George Grande and many, many others. If I've missed you, I apologize. "To the Boys of Summer 1989"
What would have happened if these boys didn't have determination, desire, talent and heart? What if Chris Fasano didn't come to every practice as an alternate and keep the team members trying hard to keep their spot on the team? What if Paul Coniglio wasn't there to run every time we needed a jet on the bases? What if Jason Hairston wasn't there to cut off all the balls hit between short and third and make them outs? What if Harlen Marks wasn't there to pinch hit and get a rally going when we needed it? What if Matt Sewell didn't get clutch hits and lead the team in on-base percentage through the states. What if Todd Halky didn't hit throughout the state and catch a great game against N.J.
What if Dave Galla didn't get 3 hits in the Delaware game and start rallies throughout the World Series? What if Dan Brown didn't go down town in the Forestville game and make great plays in the N.J. game? What if Chris Kelly wasn't there to fill in whenever, and wherever his great defensive talent was needed? What if Matt Basztura didn't reach over the fence to take away a home run against Iowa and throw a perfect strike to third against California? What if Andy Paul didn't pitch a great game and shut out N.H. and change his pitching style completely to beat California? What if Cody Lee didn't make a great play at home plate and catch a great game with clutch hitting against Taiwan? What if Dan McGrath didn't make a diving catch in the gap in the Forestville game and make a perfect throw to home plate to stop a Taiwan rally? What if Ken Martin didn't hit the cover off the ball throughout the All-Stars, and get two key hits against Taiwan while playing excellent defense? What if Chris Drury didn't have the heart and guts to give one great performance after another as our team leader? What if you weren't WORLD CHAMPS??? ?